This is one of the most impressive books we have seen in a while. Aesthetically pleasing, concise, informational and fun are just a few words I would use to describe Cannabis Cocktails, Mocktails & Tonics. There is so much knowledge in this blue and red book about drinks. 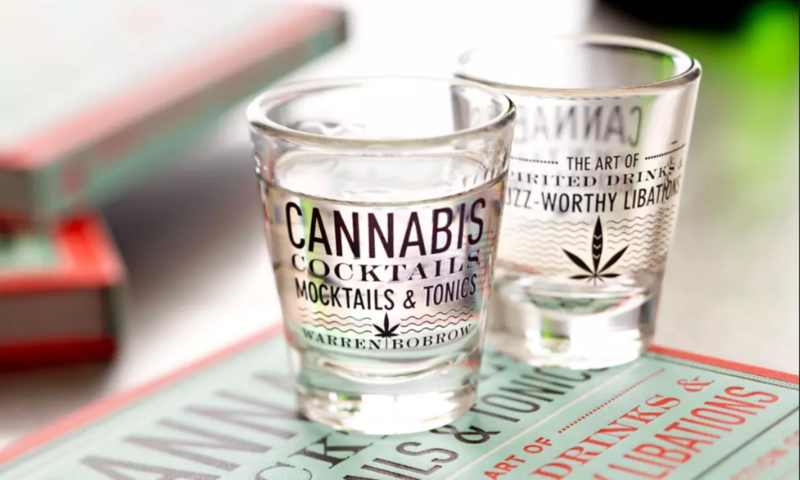 Author Warren Bobrow is clearly an expert, and he provides the reader with information to help enhance their cannabis consumption in a really good way. First of all, why alcohol? Well, for those of you who don’t know, alcohol works well as a solvent, breaking down the available cannabinoids in the plant matter to allow for better absorption into your system. Alcohol is inexpensive, and when used correctly, creates a mostly healthful drink prepared with ingredients that all work together in a positive way. Now, you might think that combining alcohol and cannabis would be dangerous — and it can be, so remembering “everything in moderation” is very helpful here. Bobrow gives plenty of warning about the dangers of over-medicating with the combination, and encourages everyone to sip slowly and listen to your body. These drinks of art were crafted to help you feel better — not worse. There are 75 recipes in this book meant to guide you through your day, such as morning cocktails intended to light you up instead of weigh you down, and afternoon cocktails to chill out with. Many of the recipes can be made without the alcohol if that’s a worry for you, and the recipes generally call for only a small amount of alcohol. Bobrow gives a list of strains, flavor profiles and what alcohol they taste best with, as well as what time of day to enjoy them. The recipes to make the infusions that go into the drinks are simple with clear instruction, and they range from tinctures and simple syrups to coconut creams. The health benefits that lie in each drink are deeper than just cannabis. Cannabis Cocktails, Mocktails and Tonics made me view the way I ingest cannabis differently. The recipes are sophisticated, bold and definitely worth your time. Previous PostPrevious Cannabis Cocktails in Bartender Magazine!